While Michigan makers have produced some of the iconic work that shaped the 20th century modernism movement, a robust design legacy isn't commonly associated with the state. Now, a new exhibit seeks to tell the story of the state's contributions, from architecture to furniture and, of course, cars. On Friday, "Michigan Modern: Design that Shaped America" opens to the public at the Cranbrook Art Museum in Bloomfield Hills, a suburb of Detroit. The exhibit was a collaboration of curators Monica Ponce De Leon and Greg Saldaña of MPdL Studio, the Michigan State Housing Development Authority and the State Historic Preservation office. Giving people a newfound understanding of the state's importance as a design center was the hope of the exhibit's founders, said Brian Conway, state historic preservation officer. "We see that, from what was coming out of Michigan, we had a major impact on the American lifestyle," he said. "Where you live and work: architecture, what you drive: the automobile and what you have in your house or office: the furniture." Not just the site of the exhibit, which lasts through May, Cranbrook is one of the focal points of the history of modernism in the state. Designed by Eliel Saarinen, who then went on to become the Art Academy's first president, the campus produced some of the best designers from the period, like his son Eero Saarinen, as well as Charles and Ray Eames. 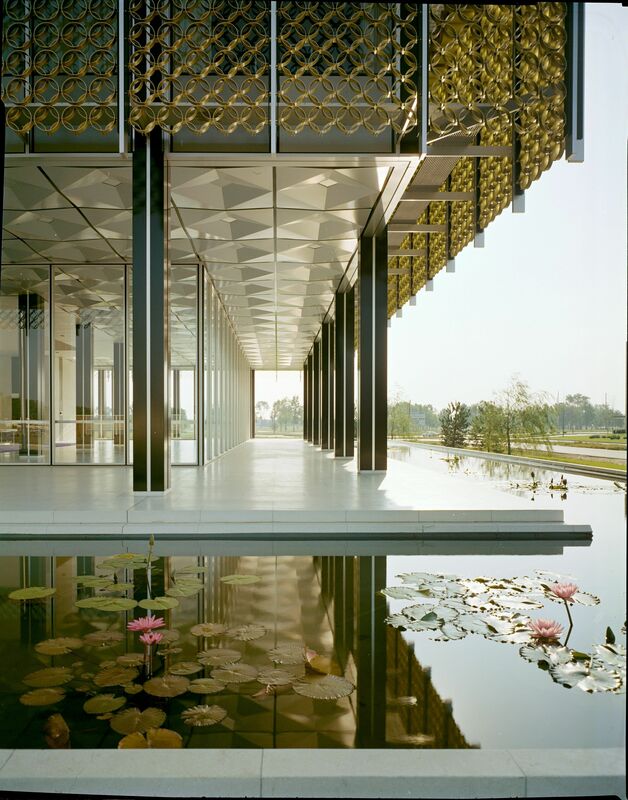 The education community, which included the University of Michigan's College of Architecture and Design, attracted international talent, and the region offered professional opportunities, from small studios led by noted architects like Minoru Yamasaki to the larger world of industrial and auto design. The work of industrial architect Albert Kahn, whose innovative touch can be seen on buildings all over Detroit, is featured in the exhibit, as well as the developing styles of cars themselves. The "Michigan Modern" exhibit is also part of the State Historic Preservation's larger effort to draw attention to this period in the state's history. "We saw a trend of resources from mid-century being threatened or underutilized, so we realized the first step in preserving historic resources is make people understand why they're important," Conway said. Their office is working to get modernist buildings recognized on the National Register of Historic Places and to elevate certain buildings to National Historic Landmark status. One of these, Conway said, is Detroit's Lafayette Park, which many people don't realize is the world's largest collection of Ludwig Mies van der Rohe properties. Adding on to the exhibit, the Michigan Modern website serves as a clearinghouse for information, listing buildings and architects and providing maps for walking tours so Michiganders can discover the history in the buildings that surround them. "We felt this was a story that goes unknown, it's kind of secret," Conway said. "If we could tell the story of this development in the 20th century that became the foundation for the design industry today, that would in a small way help change the perception of Michigan." "Michigan Modern: Design that Shaped America" runs at the Cranbrook Art Museum through October 13. William Kessler House, Grosse Pointe Park, designed by William Kessler. Photographer: Balthazar Korab. Courtesy of the Library of Congress.